Imagine life in a city free from the noise, stench, and danger of cars, trucks, and buses. Imagine that all basic needs, from groceries to child care, lie within a five-minute walk of every doorstep. Imagine that no commute takes more than 35 minutes from door to door, and that service is provided by a fast, cheap, safe, comfortable public transport system. This is the future that J.H. 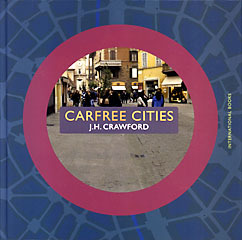 Crawford envisions in Carfree Cities. Crawford argues unapologetically that the car is a technology that has run wild, and that the time has come to reclaim city streets for human activities. He proposes a city planned to maximize the quality of life for individuals and communities, and gives practical suggestions for implementing this basic design in both new and existing cities. Crawford believes that sustainable development can only be achieved by ending car use within cities. In the face of passive acceptance of declining quality of life, Carfree Cities is a beacon of hope and sanity that offers a practical solution to the danger, pollution, and breakdown of social systems caused by autocentric development. 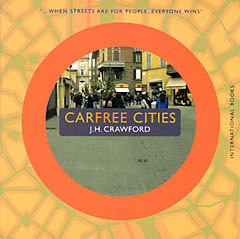 By rejecting the assumption that continued car use in cities is inevitable, Crawford takes us a step closer to the tantalizing possibility of a return to the pattern of lively, attractive streets that we had enjoyed for thousands of years, until the advent of automobiles.